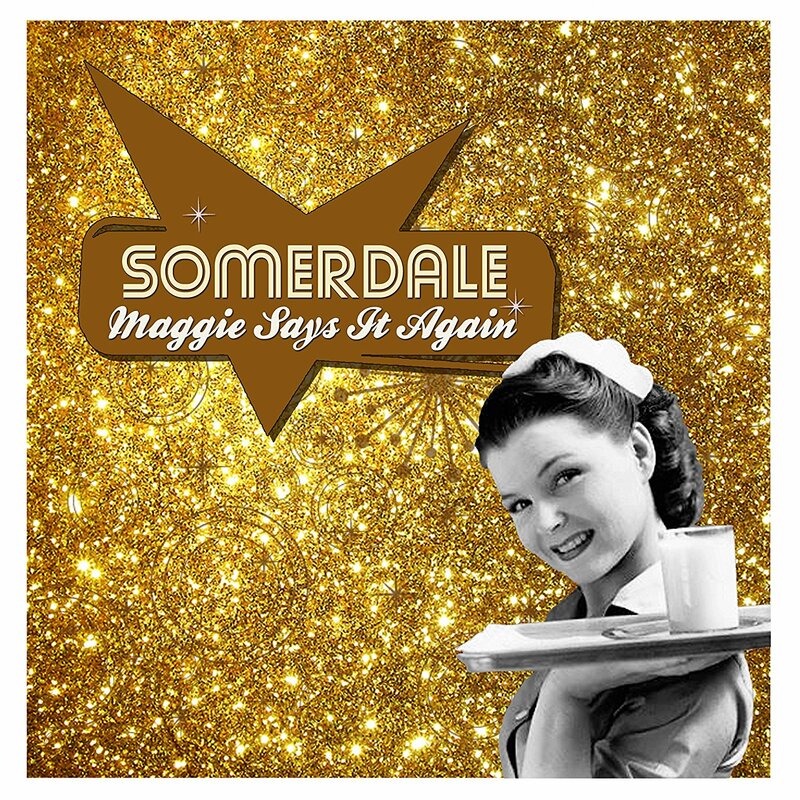 Discussions Magazine Music Blog: SOMERDALE/Maggie Says It Again: Power Pop at its finest! 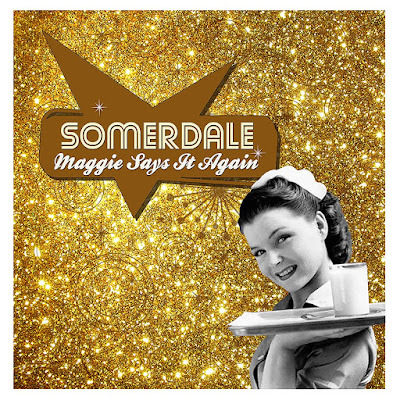 SOMERDALE/Maggie Says It Again: Power Pop at its finest! Remember the good ol’ days when a new album gave you a total thrill on first listen? We all get older, real life gets in the way and those goosebumps-inducing moments don’t come quite as often as they used to. I remember distinctly when I first heard the 20/20 debut…. And the first Cherry Twister album… And Badfinger’s WISH YOU WERE HERE… The Lambretta’s BEAT BOYS IN THE JET AGE and the self-titled album by The Beat (AKA Paul Collins’ Beat)… Oh, and I can’t forget Dillon Fence’s ROSEMARY… ditto that to Splitsville’s PET SOUL full length… There are many more, but those are the first ones that come to mind. Classic albums, every one of them! Well, I’m glad to say that Somerdale’s MAGGIE SAYS IT AGAIN is an album that brought those inner tingles to the surface and made me feel glad to be very much alive and able to feel again! This is an album jam-packed full of so many hooks, you’ll swear that you’ve just landed in the best bait ‘n’ tackle shop on the planet! And those harmonies! Damn. Sounds like they channeled the spirits of Carl and Dennis Wilson and asked them to visit that magical place that falls somewhere between the Beach Boys and The Beatles (circa ABBEY ROAD). This is truly Power Pop at it’s most magnificent! This shimmers and shakes, quivers and quakes and all of that good stuff. This one is going to give your goosebumps goosebumps! This isn’t the band’s first foray into the Pop world but it is an album that they were born to make. Chuck Penza, James Caputo and JJ Fennimore have combined their talents and created what many people will call THE Power Pop album of the year. I’ve heard some great albums this year and I am fairly confident that there won’t be another Power Pop platter released in 2017 that will be better than this one. It is right up there with Duncan Reid & The Big Heads’ latest. Imagine the sweetness of Cherry Twister, add in the edgier side of Shoes, throw in some Brit-influences from The Records, some ‘70s AM radio influences (‘Waiting For You’ sounds like Splitsville covering Neil Diamond covering Sly & The Family Stone) and you’ve got Somerdale. “Broken English” has a wall of backing vocals that recall Shoes as produced by Phil Spector. In fact, it’d be fair to say that this trio recalls little bits and pieces of every band mentioned before. But don’t get me wrong – they may pay musical homage to their influences (direct and indirect) yet they sound like… Somerdale! “Broken English” has a wall of backing vocals that recall Shoes as produced by Phil Spector. Ya know, I could go on and on but you catch my drift. And if you aren’t picking up what I’m laying down, then let me make it plain and simple: YOU NEED THIS! Really!